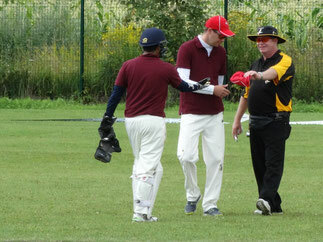 Red & yellow cards in Swiss cricket? It's commanding the headlines, all this talk and discussion about the introduction of red & yellow cards intp cricket at the end of this season when the MCC issue a new code to come into effect on 1 October 2017. Could it become a reality and could we see it in Switzerland too? Changes to cricket regulations don't necessarily find their way into Swiss domestic cricket. The ICC limited overs regulations for example. But the MCC Laws of Cricket are different in that those are the ones we play by. Any changes to the MCC code will have an effect on us in Switzerland (and indeed in Europe) as they are automatically adopted. Variations to the MCC Laws of Cricket have to be in our local Rules & Regulations, in the case of Swiss domestic cricket, that means they have to be explicitly documented in the CSPL or Pickwick Twenty20 Rules & Regulations. Even though the season is a number of weeks away, and 1 October is after our season ends, as an umpire and cricket enthusiast I decided to investigate what changes are likely to occur. There are many journalists and cricket pundits writing about these changes, but, on reading reports & articles on this subject, not excluding the MCC Laws of Cricket consultation paper for 2017 Code, I'd like to share my interpretation and assumptions with you. The Preamble, which covers things like the Spirit of Cricket, is likely to receive quite a re-write. However, from what I gather, changes are likely to be made in the interest of clarification and make it more straight forward. Protection from LBW and penalising the bowler from a wide ball are two things that the MCC are looking at when a batsman plays a switch hit or reverse sweep. These shots are being played on a regular basis and prevalent in Swiss cricket, particularly from younger players. Consideration is being given to the separating regulations dealing with 'limited overs cricket' by far the most widely played form of the game and the only form played in Switzerland. Timed cricket regulations would then no longer apply to shorter forms of the game. Extend regulations for absent players to cover batting too. Many leagues have their own penalties written in, for instance a player coming into bat that was absent in the field can't bat below no. 5, but there is nothing official in the Laws of Cricket. Yet. Amend a 'Runners' starting position so their starting position can't be more forward than the batsman he is running for. Although runners are often not permitted in limited over cricket, there is currently no restriction in Swiss domestic cricket (as per MCC Laws of Cricket). We can expect some restrictions on the size & dimensions of a cricket bat in the new 2017 Code, something that most that have voiced an opinion on this consider to be long overdue. Likely dimensions will be defined as: bat edges will have a maximum allowance of 40mm and bat depths must not exceed 67mm (60mm plus an allowance of 7mm for a possible curve on the face of the bat) and a maximum width of up to 108mm. Changes to whether a glove has to be in contact with the bat are not expected, however, consideration is being given to replace 'holding' by 'touching'. Defining universal standards on length of pitch for juniors and perhaps differentiating between girls & boys cricket, is likely to be included in the new Code. Changing the Law on covering the pitch and the restrictions on what can & can't be covered to make covering all of the pitch the defacto standard. Amend when 'short-run' is called by the umpires, i.e. instantaneously as opposed to waiting until the ball becomes dead as it is today. Consideration to make the receiving of an extra ball for no-ball or wide an optional one for the batting side. Making a ball bowled under-arm a no-ball and defining what constitutes an under-arm ball. Amend Law 24 so a ball can only bounce once. A no-ball to take precedence over a wide, and a batsman cannot incur both. Consideration of disallowing leg-byes after taking evasive action will probably not be changed for a fear of an increase in short-pitched deliveries. Consideration is being given to re-drafting of run-out & stumped so that once something is grounded beyond the popping crease the batsman is safe, even if subsequently raised. Combining the Laws 'handled the ball' and 'obstructing the field', effectively removing 'handled the ball'. Redraft Laws on movement of wicket-keeper and movement of fielders to allow for a response to the striker's movement (i.e. the switch hit & reverse sweep). To disallow 'mock-fielding' (for instance pretending to throw the ball). It will interesting to know if this might be extended to bowlers exhaling loudly to disguise the bowling of a slower delivery. Remove the distinction between the pace of the delivery for high full pitched deliveries and replacing waist-height with hip or even above the height of the stumps. Make 'mankading' a possibility right up until a bowler would have released the ball. Finally, there are proposals to allow the use of penalty runs, and even red & yellow cards for the most serious offenses, as a deterrent to player misconduct and as a means of dealing with an incident on the field at the time of occurrence. If cards are to be introduced then it would be for Level 3 (intimidating an umpire & threatening to assault another player, team official or spectator) or Level 4 (threatening an umpire, any act of violence on the field of play) offenses. Interestingly, if the transgressor is the batsman he will be 'retired out'. Personally, I hope the MCC will shy away from red & yellow cards and that the only 'whistle' I will need is the one I wear to tournament dinners. What is certain, there are some substantial changes being considered and, some more than others, could have a large impact on the domestic game here in Switzerland & in continental Europe. Alexander Mackay is the current President of Cricket Switzerland, the premier governing body for cricket in Switzerland. 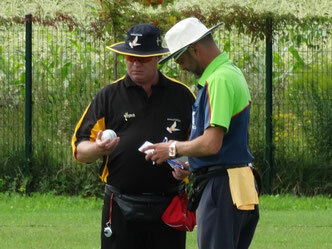 He sits on committees for Cricket Switzerland, the Swiss Federation of Cricket Umpires & Scorers (swissFOCUS), the Cricket Coaches Association of Switzerland (CCAS) and his local club. He is also an internationally qualified umpire and former member of ICC Europe's umpiring panel, umpiring in tournaments around Europe with a particular interest in developing cricket in ICC affiliate countries & non-ICC nations.